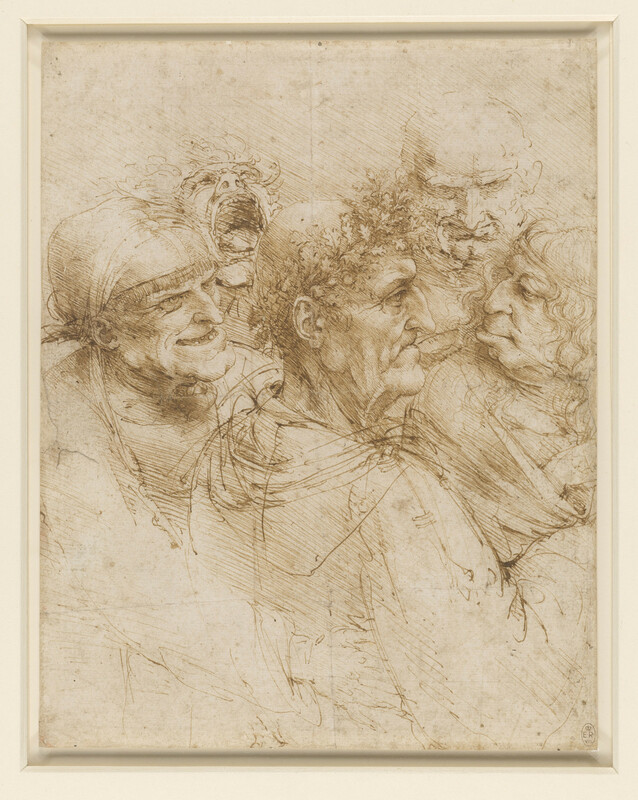 Recto: a drawing of a close group of five heads; a bald old man of the classical type, in profile to the right, crowned with a wreath of oak leaves; an elderly woman with a fringe and a huge chin, grinning; a creature with wavy hair; a demoniac yelling; an old man, full face, looking downwards. Verso: several lines of notes. The central figure is surrounded by a band of Gypsies in traditional dress. The hideous woman on the right reads his palm - this part of the composition was inexplicably trimmed off at an early date - while glancing across at her cackling accomplice, who reaches under the sleeve of the man to steal his purse. Gypsies had arrived in western Europe in the early fifteenth century, soon acquiring a reputation for this combination of fortune-telling and theft, and on these grounds all Gypsies were ordered to leave Milan in April 1493, the probable date of Leonardo's drawing. The subject was to be popular with painters in the circle of Caravaggio a century later.